Seven Generations High School derives its name from ancient Indigenous philosophy, which holds that decisions made in the present should be sustainable seven generations into the future. In working with the school for the past three years, we have seen how committed the teachers and staff are to this principle, and we’ve had the pleasure of working with them to help them achieve this important goal. The resources we’ve created together reflect the rich cultures of the 10 nearby nations, who founded the Seven Generations Education Institute, and will be accessible for teachers and students for years to come. During the first year of our collaboration, we worked with teachers, Elders, and Knowledge Keepers to create resources that focused on dimensions of wellness and feast bags, as well as on the significance of the sweat lodge, tobacco offerings, and naming ceremonies. However, Seven Generations High School chose to keep some of these resources private, meaning that they would not be shared with our other school partners who use Learning Bird. “There are certain ceremonies, protocols, and traditions that are sacred, and specific to a certain place or Nation, and some communities want that knowledge to remain in the community,” said Natalie Gilbert, Learning Bird’s Education Content Manager. We are committed to respecting these wishes, and we work to ensure that every school and community has control over when and how they share their resources. During the 2017/18 school year, we worked with Seven Generations High School to build resources on the Anishinaabe creation story of Sky Woman, from Basil Johnston’s Ojibway Heritage. The resource kit includes slideshows, a handout, and a video that introduces students to the story of Sky Woman. Together with the teachers, staff, and help from students at the school, we were able to bring this beautiful story to life in a video featuring illustrative paintings by students at the school, combined with narration by Julija Graham, a teacher at the high school. “It’s really great for students to see their own creative work reflected in resources that are built for the school, and to hear voices from the community that they recognize…it keeps content localized and incorporates the talents from students and other community members” said Natalie. Another focus of our work with Seven Generations High School last year was on creating resources about Kay-Nah-Chi-Wah-Nung, Ojibway for “Place of the Long Rapids.” This site was both an important place of early habitation, and ceremonial burials. The resources we created together discuss the historical and cultural significance of Kay-Nah-Chi-Wah-Nung, including the signing of Treaty 3, and the forced amalgamation by the Canadian government of the Indigenous peoples in the region into the Rainy River First Nations. Through the activities in the kit, students are also encouraged to think about how the construction of the Kay-Nah-Chi-Wah-Nung Historical Centre and a traditional roundhouse at the site symbolize the resilience of the Rainy River First Nations. The resource kit includes an interview with Elder Gilbert Smith, who shares his knowledge of the burial mounds at Kay-Nah-Chi-Wah-Nung, also known as the Manitou Mounds. This year, we will again be working with Elders and Knowledge Keepers from the Rainy River First Nations to create resources for Seven Generations High School. Earlier this month, Natalie and Learning Bird’s Education Training Manager Joelle Chemali travelled to the high school to document the Fall Feast. 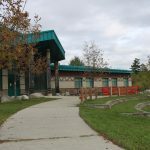 “There were 14 stations set up to allow students to experience different activities, including Métis jigging, bannock making, storytelling, and drumming. What I really liked about it was that everyone was happy and willing to share the knowledge and information they had about each activity” said Joelle. 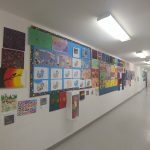 One of the stations was dedicated to helping students understand the impact of the Residential School system on individuals, communities, and Nations in the region. Elder Kelvin Morrison spoke to students about some of the painful experiences he lived through during his time at a residential school. Kelvin also shared his story with us on camera, and Joelle noted the significance of this for students and others, “It’s important to make people more aware about what actually happened in these schools, and also to make them aware of the impact the Residential School system had on survivors’ children, grandchildren, and communities.” While some of our partners choose to keep resources around residential schools private, for in-community use only, others have been comfortable sharing their stories and experiences to benefit all students using the Learning Bird platform. We are very grateful to have worked with several Residential School survivors over the years and to have assisted in documenting both their traumatic experiences and stories of resilience for future generations. Our team looks forward to creating engaging, culturally-relevant resources with the video footage and audio materials Natalie and Joelle collected while on-site at Seven Generations High School this year. They have seen firsthand how committed the teachers and administrators are to both helping students succeed and to helping them connect with their culture. “Principal Sean Taggart is really involved, and listens to his staff very carefully. Over the years, their staff hasn’t changed much, which means teachers enjoy their work and are dedicated to their students. There’s a strong sense of partnership, and they’re all working together to achieve the same goal, which is amazing to see,” said Joelle. She’s already looking forward to working closely with the teachers again when she travels back to the school in the new year. She will be returning to offer the teachers one-on-one coaching around how to make the most of the resources we’ve created over the past few years and how to best integrate them into their year plans.